An occurrence of a most alarming and unfortunately fatal nature occurred on Friday morning in the drift-way of the tunnel now forming for the Edinburgh and Leith Railway, by which the works have been much damaged and four lives lost. Our readers are aware that the chief feature in this line of railway is a tunnel through the whole extent of the New Town, from Canal Street on the south to Canonmills on the north. 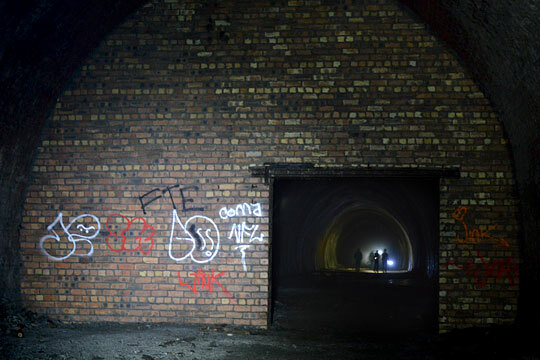 The tunnel runs across Prince’s Street, through St Andrew Square, down Duke Street and Dublin Street, through Drummond Place, and down Scotland Street, in the low ground at Canonmills, where it again emerges into the open air. The making of this extensive tunnel had been divided into three or four contracts, and the drift-way of them all had been nearly completed; the last being the centre one, where the melancholy accident occurred, extending from about the foot of Duke Street to a considerable way down Dublin Street. The cause of this boring being left was in consequence of an interdict from Government, which obliged the contractors to work the drift from the upper end. This drift-way, it may be necessary to explain, is a comparatively small shaft bored through the ground, and being afterwards widened and lengthened, forms the completed tunnel. The drift-way in this railway, we understand, was so high that a man could walk upright, but not very broad. 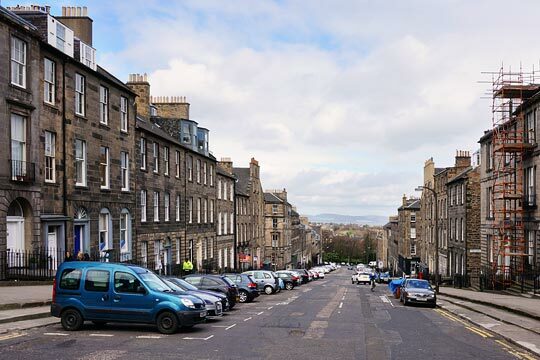 A view down Dublin Street in Edinburgh's New Town. That portion of the line extending through St Andrew Square has long been completed, and has been standing unused and unworked for the last seven or eight months, and during all that time there has been a gradual accumulation of water in the mine, being fed from the springs of the old North Loch and other water courses in the bowels of the earth in that direction. Of this the contractors were well aware. As the miners, however, were gradually carrying the drift-way in the centre contract up Duke Street to meet it, and were coming near to the point of junction between the two, they felt the necessity of proceeding with caution, so that the pent-up waters in the upper drift might find a vent through the nearly opened shaft without injuring the works or endangering life. Why this course, obviously, so full of hazard, was adopted, rather than the more safe one of pumping the water to the surface, does not appear, unless it may be inferred that the additional expense this would entail upon the works deterred them. If so, this is one added to many melancholy instances which might be adduced, of a narrow economy, in the first instance not only causing many valuable lives to be sacrificed, but of adding in the end, tenfold to the expense of the operation. Such being the course adopted, however, the workmen had been for the last eight days employed, not in the usual operation of mining, but of drilling small holes through the strata, in order to discover the water, it being understood that if they did not in this way come in contract with it for a certain distance, they might then proceed in quarrying away more of the earth; while if the water should come, it would find a vent through the holes thus drilled, the solid barrier between resisting the passage of the whole body; and in this way they expected the accumulation of water would be gradually and safely drained. Here, however, began the error which has ended so fatally. The workmen who bored straight forward never discovered the water, and the reason of this, as it now turns out, arose from the fact that, from some slight deviation in the line of the drift-way either by the one or the other contractor, the two lines of shaft did not meet precisely in the centre, running straight into each other as was intended, but the centre one passed by a very slight difference indeed, to the eastward of the other. In this way the men had carried their line a little farther than the place where they ought to have met with the upper shaft, having all unconsciously to themselves, a very slight partition of clay between them and the immense accumulation of water in the neighbouring mine. The works were carried on day and night, and the workmen, three or four of whom could only get to the place at once, were employed in three divisions, working eight hours each, and descending by the shaft or eye sunk at the head of Dublin Street. As they had been for some days in expectation of meeting with the water by penetrating to the other shaft, the attention of all was naturally called to every symptom of the gushing of water. On Thursday, one of the workmen was working on the west side of the drift, when four or five small jets of water gushed out. He called the attention of his companions to the circumstance, who thought it was the pent up flood, and, throwing down their tools, were about to run for safety; but the man who first discovered it assured them it was a small spring in the place; and on the jets stopping a short time after, they began to be reassured. There was another workman who had been employed in the upper mine that mention to his companions he thought they had deviated from the line of the other shaft, but no attention was paid to his remarks. On Thursday night, however, Mr Mitchell, the contractor, becoming anxious about the joining, gave directions that when the morning shift of men went down at six o’clock, he should be called as he meant to go down with them and ascertain the progress they had made. Accordingly, on Friday morning, Erskine, the ganger or superintendent of the men, was to have called on Mr Mitchell, but for some reason or other he did not do so, but he spoke to his brother, Mr Peter Mitchell, a person who was employed by his brother to superintend the workmen generally, but who was not conversant with the business of mining. He was induced to go down with Erskine, about six in the morning, where two men were already working. An interior view of the tunnel, with its lining painted with calcite. 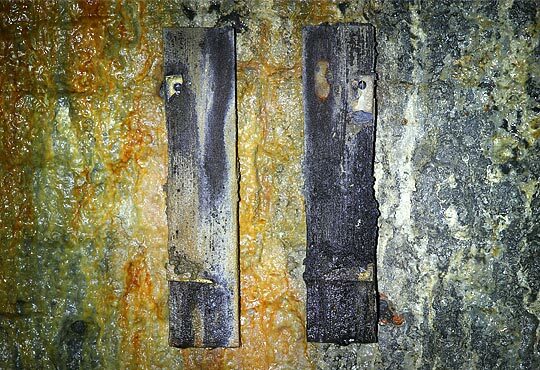 What passed in the mine after this can only be a matter of conjecture. But a short time after Mr Mitchell and the ganger had gone down, about half-past six, a boy, about fourteen years of age, named Jack, was lowered down the shaft, when at the bottom, and before he had let go his hold of the rope by which he had descended, he heard a noise, as he describes it, like a loud roar of thunder at the head of the drift. Terrified with the sound and instantly divining the cause, he cried to the men above to hoist him up. They also had heard the noise, and animated by the same terrors, they drew him quickly to the surface. Scarcely had he reached it, when a huge wave came surging up the shaft, a perpendicular height of eighty feet, the spray from which dashed fiercely against the roof of the wooden shed that encloses the descent. But this was only for an instant. Falling back again into the shaft, almost as quickly as it had risen, the angry waters began to find a vent through the drift which leads from the shaft down Dublin Street. The opening that had been made, however, was altogether inadequate to afford a channel to the torrent, so long pent up; and besides the debris brought down from the sides of the drift began to choke up the passage, and again to dam up the course of the torrent. In consequence of this, and the great compression of air in the mine, a second explosion took place at the foot of Dublin Street, this time towards the surface, when the water poured out upon the street, nearly opposite the entrance to the Broughton Markets, to such an extent that the area of Mr Brace, spirit dealer in Dublin Street, was flooded to the extent of about four feet, while a considerable volume poured down into Drummond Place. 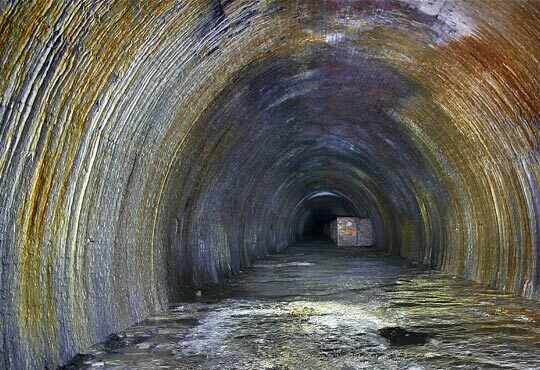 But the main stream continued its course underground, to the entrance of the drift at Canonmills, where it flooded the terminus of the completed portion of the railway to a considerable extent, filling up, for a time, the whole breadth of the railway line. So soon as the workmen on the surface had recovered from the surprise and fright this sudden bursting had caused among them, their first thought was for the four unhappy men who were down in the mine. That they could have survived such an enormous rush of water was impossible; the most sanguine could not entertain a hope of their escape. Nevertheless, as soon as the water had subsided in the shaft, men went down, and after some little search they succeeded in finding the bodies of Erskine, the ganger, and of Blair, a miner from Liberton, which were lying at the bottom of the shaft. They were, as might be expected, quite dead; and appeared to have been swept down from the point of bursting to the place where they were found, and there to have been caught in the eddy caused by the circular shaft. The others were not then to be found, and it was supposed had been swept down the drift-way. The noise occasioned by the bursting of the waters was distinctly heard by the families in the street; and the news of the melancholy accident having soon spread, a crowd was quickly collected, which continued about the works the whole day. Information being conveyed to the Police Office, a force was speedily despatched to the spot who rendered great service in keeping off the crowd, and otherwise preserving order. We may mention, also, that in the course of the forenoon, Bailie Mack, Mr Dymock, the procurator-fiscal, and Mr Haining, the superintendent of police, visited the scene of the accident, examined the workmen as to its origin, and otherwise took all the necessary steps to obtain judicial and precise information in regard to it. The remains of a tablet, used to identify locations within the tunnel. The fate of the two miners, whose names are Blair and Philips, is invested with a melancholy interest. We have already mentioned that the work was carried on night and day; and these men had gone down at ten o’clock on the previous night, and should have been released at six o’clock on Friday morning. Owing, however, to the fact that the men who should have relieved them had slept longer than usual, they continued to work and were thus involved in the dreadful calamity. Indeed, at so critical a period did the accident happen, that the relieving men had arrived at the shed and engaged in putting on their working-dress to descend into the mine, when they were alarmed by the crash of the eruption. The poor boy, too, we have mentioned, had a narrow escape. A few minutes longer, a few yards farther advanced into the mine, and no human power could have saved him. He seemed to be duly sensible of his perilous escape; and the wild expression of alarm pictured on his countenance hours after the accident, testified to the vivid impression made on him by the danger. Erskine, the ganger, had gone down just before him, and could not have reached the place where the men were working when the eruption took place. The boy states that he was only a few yards up the drift, and that he heard him utter a loud shriek at the time of the crash, as if he also then had become aware of his awfully perilous situation. We may mention that all the four unfortunate men were married and had families. The wife of one of them, Philips, whose body had not been recovered, resorted to the scene in the course of the forenoon, and her wild shrieks and cries were calculated to touch the coldest heart. The water continued to flow at the aperture in Canonmills during the whole of the day, and the mine remained with from four to five feet depth of water in it during the greater part of the day. The slowness of its progress at last, compared with its fury on its first eruption, may be accounted for by the fact that debris brought down by the torrent had filled the narrow passage - and particularly at the bottom of Dublin Street, where the water forced its way to the surface, the drift had partially fallen in, the level of the street having perceptibly fallen. There is also on the north side of Drummond Place, a ridge of rock intersecting the drift, through which a passage is drilled, but so small as to prevent the great torrent of water forcing its way at once. Owing to these impediments, the water could only be drained off gradually. At the Canonmills station a channel was cut for the stream, conducting it into a common sewer on the line of railway, which carried it off. One of the blockwalls erected when the tunnel became an air-raid shelter. All the bodies were recovered. Erskine and Blair, as we have mentioned, were discovered about half-past ten in the forenoon at the bottom of the shaft. They were found together, Blair’s hand grasping the leg of Erskine - a position which would indicate that Blair had sought safety in flight down the drift, and had reached Erskine, but were both overtaken by the raging flood, which no speed could have outstripped. The bodies of Philips and Mitchell were found, the former about three, the latter about four o’clock in the afternoon. They had been carried down the mine as far as to the rocky ridge we have mentioned below Drummond Place, where their farther progress was stayed by this barrier. They were brought to the surface in the presence of a collected crowd, and Philip’s wife, who could not be long kept away from the scene of the calamity, renewed her lamentations at the sight of her husband’s corpse. We need not add that this melancholy event formed the theme of conversation in the city, or that it has spread a general gloom over the workmen engaged in these operations. The deceased were all respected by their companions. Erskine was a faithful and vigilant superintendent, and the loss of Mr Mitchell, the brother of the master, is deeply regretted by the men. He was employed as general superintendent of the contract, and had the happy art of gaining the good will of those under him without neglecting the interests of his employers. As the families of all these poor men, with the exception, perhaps, of Mitchell are left destitute, a public subscription for their behoof will be necessary, unless, indeed, the directors of the railway follow the laudable example of the Marquis of Londonderry - an example not more laudable than it appears to be just - who makes it a point of providing from his own funds for the families of all the workmen who have the misfortune to lose their lives in his coal mines.